Through this event you will be able to help KNCHS batch '99 in pursuing its yearly community extension activities (through medical mission and feeding program) and provide seedlings for an indigenous community (to be identified) here in South Cotabato. Please watch out for more Details regarding the Registration Fees and the freebies included, Sponsors' Giveaways, Registration venues, T-shirt (singlet) design and the Race Map. Get fit. Accomplish your goal. Socialize. Contribute to a cause! 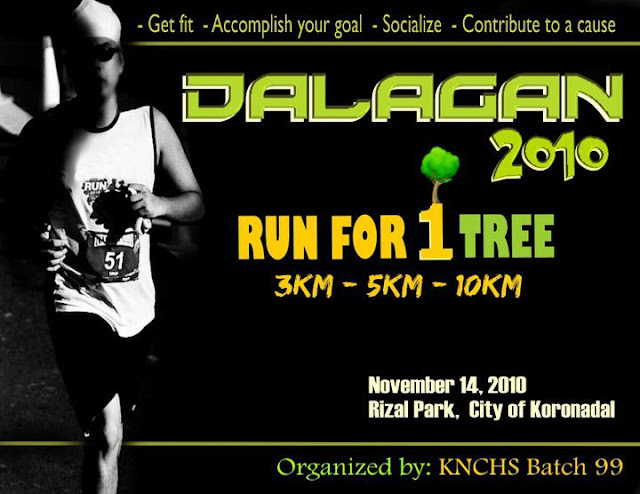 Join DALAGAN 2010!